Studies on senior health and wellness, reveal that many slip and fall accidents and injuries happen in the person’s own home. Of all the rooms at home, the bathroom is by far the most common site for aging adults to slip and fall. However, there are many things that family caregivers can do to turn one of the most dangerous rooms in the house into a place where aging loved ones can feel safe, get clean and properly begin and end their day. Water on hard surfaces translates to slipping, whether it’s inside the shower or tub or out on the tile or linoleum. Family caregivers must first reduce the risk of slipping by creating non-slip surfaces whenever possible. Instead of fluffy throw rugs, family caregivers can put down no-skid bath mats in key areas on the bathroom floor. 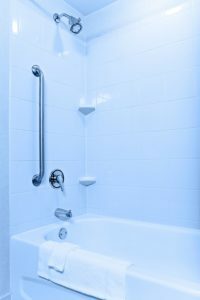 In tubs and showers, there are numerous textured products on the market to reduce the slick surfaces in those vulnerable places. When aging adults feel themselves starting to lose their balance, they often have nothing to reach out for. Shower and tub walls are slick and the walls near the toilet may only offer a flimsy towel bar that won’t support any weight. Family caregivers must install grab bars, strong additions that can support the weight of a person. When installed in the shower, near the tub and by the toilet, aging adults have something to hold on to so they don’t lose their balance or go all the way down to a fall. Numerous bathroom safety items can transform the place from a slippery danger zone to a safe and secure oasis. Some of the top safety items on the market for seniors include shower chairs, tub chairs, hand-held shower heads, pump dispenser shampoos and soaps, lever faucets, body scrubbers with long handles, and much more. Implementing these devices can make the bathroom experience much safer for aging adults. Sometimes a bathroom is simply too dated to really accommodate an aging adult’s needs. Features like high thresholds between floor, tub and shower, awkward layouts for wheelchairs, and bulky sinks and toilets can hinder a senior’s ability to stay safe. Family caregivers can consider a bathroom remodel for appliances and ideas to make seniors more comfortable in the bathroom and make the room a better fit for their physical needs. With home care providers on the job, aging adults will have a professional assistant on hand to help them with daily tasks. Home care providers can lend a hand in showering, bathing, dressing and grooming. With a strong and steady adult assisting seniors in the bathroom, the odds of a slip and fall accident go way down. Home care providers can also help in other ways, like meal preparation, companionship and light housekeeping. If you or an aging loved one are considering Home Care in Faith NC, please contact the caring staff at TenderHearted Home Care today. (704) 612-4132.